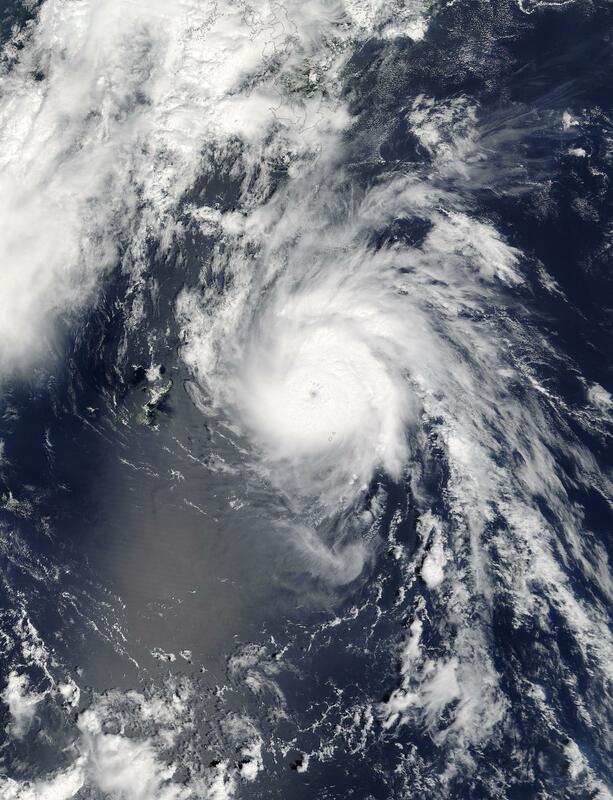 NASA's Terra satellites provided a visible view of Typhoon Namtheun when it was moving through Japan's Ryukyu Islands. Namtheun is expected to make landfall in Japan's large island of Kyushu on Sept. 3. The Moderate Resolution Imaging Spectroradiometer or MODIS instrument aboard NASA's Terra satellite passed over Namtheun on Sept. 2 at 02:20 UTC (Sept. 1 at 10:30 p.m. EDT) when it was moving through Japan's Ryukyu Islands. Japan's Ryukyu Islands is a series of islands in what appears to be an arc. The chain of islands stretch southwest from Kyushu to Taiwan. The image showed that Namtheun had a small eye surrounded by a thick band of powerful thunderstorms. At 1500 UTC (11 a.m. EDT) on Sept. 1 Typhoon Namtheun had maximum sustained winds near 115 mph (100 knots/185 kph). The center of the storm was located near 28.1 degrees north latitude and 130.8 degrees east longitude, about 323 nautical mile south of Sasebo, Japan. Namtheun was moving to the north at 7 mph (6 knots/11 kph). The Joint Typhoon Warning Center (JTWC) forecast calls for Namtheun to track to the north and make landfall on Sept. 3 on Kyushu, the southwestern-most of Japan's main islands. The storm is then expected to move to the north-northeast and weaken as it travels through the Sea of Japan.